The 24-Hour Mommy: I Heart Human Nature Products! 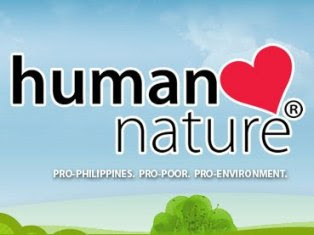 I Heart Human Nature Products! I fell in love with the products right away. But what really drew me towards using the products was the fact that it was pro-Philippines, pro-poor, and pro-environment. Human Nature products are manufactured by Gandang Kalikasan, Inc. which was founded by Anna Meloto-Wilk and Camille Meloto. The sisters are daughters of Tony Meloto of Gawad Kalinga that's why the company is able to provide jobs for the settlers of Gawad Kalinga villages and other local cooperatives in the provinces. Who wouldn't want to support an advocacy such as that? Not to mention the fact that all of their products are affordable even to the masang Pinoy. The Royal Jelly and Aloe Vera Night Face Moisturizer is a revelation. Unlike other night creams I used, it doesn't leave my face greasy in the morning. I still have to see its anti-ageing benefits since it's only been a few nights since I started using it. The Bug Spray has been effective in warding off mosquitoes at night. I also love its citronella scent and the fact that it's made of virgin coconut oil. Some of my online friends who are also Human Nature users advised me to register as a dealer so that I can enjoy 20% off on my purchases. I think I'm gonna do that soon. Besides, I think this can be another earning opportunity for me since there aren't many resellers here in my area. What do you think?